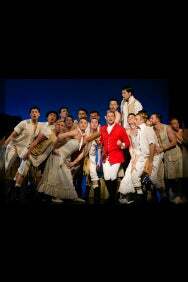 We do not curently have theatre tickets available for The Pirates Of Penzance. This could be because we have simply sold out or it could be that this show is no longer running. The information on this page remains purely for historical and informational purposes. The award-winning and exquisitely funny new take on the much-loved classic The Pirates of Penzance makes a welcome return to these shores after a huge critical and popular hit in Australia, when it landed in Cate Blanchett's Sydney Theatre after a national tour. The tale of a child apprenticed to a band of tender-hearted, orphaned pirates was an immediate triumph for Gilbert and Sullivan and remains their most popular and successful work. Winner of 'Best Off-West End Production' 2010 - What's On Stage Awards. From Tower Hill (11 mins) on the District and Circle lines. Leave by the main exit and turn left. Walk past the Roman wall and cross Minories at the traffic lights.